Packed with antioxidants, phytonutrients and health promoting properties, cranberries have long been valued as 'functional' foods. 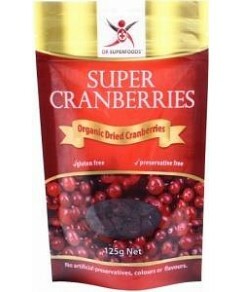 Organic dried cranberries are full of genuine goodness. Ideal for snacking, baking or as an ingredient in muesli, cereal and trail-mix. They add tang to stuffing and summer salads. Dried cranberries are sweetened with organic cane sugar to balance out the tartness. Enjoy the cranberries tart flavour in savoury recipes.